SU coach Jim Boeheim is competing with 47 other men’s basketball coaches in the Infiniti Coaches’ Charity Challenge, taking place through March 16. 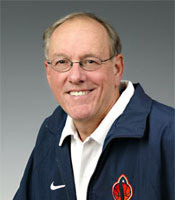 In order to win $100,000 for his charity, the Jim and Juli Boeheim Foundation, he needs votes from SU supporters. As of this writing, Boeheim is in seventh place, with 4 percent of the vote. In first place, with 33 percent is Coach Thad Matta of Ohio State with 33 percent. “Let’s show the world just how passionate we Syracuse fans are,” says Kelly Taylor, administrator of the Jim and Juli Boeheim Foundation. Since the Boeheim Foundation began in the spring of 2010, close to $1.5 million has been awarded to more than 82 organizations throughout Central New York. “The Jim and Juli Boeheim Foundation strives to enrich the lives of kids in need within our Central New York community, as well as provide support for eliminating cancer through research and advocacy,” says its website. First-round voting runs until 11:59 a.m. on Jan. 26. Each person can vote once each day. After the first round, the top 24 vote-getters will advance to the second round, which will run until 11:59 a.m. on Feb. 16. In the third round, the top 16 vote-getters will compete until 11:59 a.m. on March 2. The four coaches with the most votes will compete in the Final Four, which will run until 11:59 a.m. on March 16.